more power efficiency than 2D NAND. 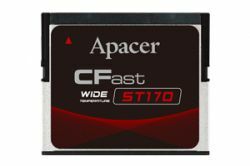 This new flash memory card comes with SATA 6.0 Gbps interface for higher performance and consists of SATA-based 7-pin signal segment and 17-pin for power and control purposes. Designed without DRAM on the internal controlling unit, ST170-CFast ensures data integrity by preventing data loss during a sudden power outage.